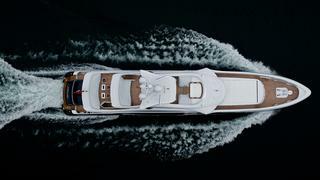 In the world of superyachts, patience is both a virtue and an anomaly, perhaps even an anachronism. In truth, many yacht builders prosper by understanding that their customers prefer, if not instant, then certainly speedy gratification. 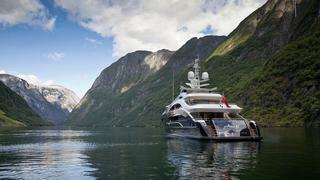 It’s all the more interesting then, that Heesen, a company that started by building custom yachts but found a strong niche in semi-custom series boats, begun on speculation for faster delivery, courted a client with plans for a fully custom yacht, a more challenging journey that took them back to their roots. In doing so, the yard delivered one of the stand-out yachts of 2015, the 50 metre Ann G.
“It was a great experience to work with such a committed owner,” says Heesen’s sales and marketing director Mark Cavendish. “The yard and the owner’s team really worked well together on _Ann G _and the owner was at the yard frequently.” Of the 10 current projects at the yard, four are full custom, with four more in discussion. The project came to Heesen by a rather unusual route – a designer the yard had never worked with – and developed in a rather unusual way – via collaboration driven by the owner and designer Clifford Denn involving naval architects from several yards. Together they explored and rejected extras such as a helipad, revised the yacht through several lengths and beams – even considering both displacement and semi-displacement hull types – to arrive at the look, the layout and the technical envelope of _Ann G _that matched the owner’s vision. It started in 2010 when a France-based broker asked Denn to meet a prospective client who wanted either a semi or full-displacement yacht around 50 metres. Denn, who worked for Foster + Partners and Martin Francis before setting up his own studio near Antibes in 2003, recalls the brief was “a unique yacht that stands out from other yachts of its size and has a real identity”. 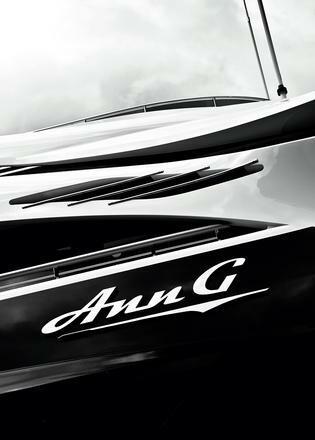 Ann G was to be a five-cabin yacht with a side-loading tender bay to allow a beach club aft, as well as a large sundeck with a covered living area in the middle that could divide or unite the entire deck by means of sliding glass panels. The owner had seen an 85.5 metre Oceanco called Sunrays that was styled by the late Bjorn Johansson and wanted Denn to explore introducing that yacht’s floating deck look. “He also mentioned the lines of the 47 metre Benetti Imagination Series, particularly the curving stern stairs,” Denn says. Designers were asked to present exterior styling and a preliminary GA for a 52 metre, with both the influence of Sunrays and original design. By October the owner had chosen his favourite look from numerous Denn sketches. 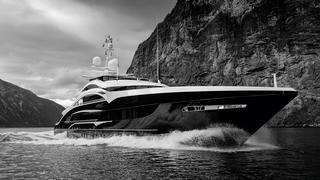 What emerged was a 55 metre concept more masculine than Denn’s original idea and more flowing than Sunrays. With a 3D CAD model for guidance, in spring 2011, Ann G's owner asked various yards to develop it based on their platforms – and all responded with larger plans and over-budget construction costs. “The owner had been very clear about how much he intended to spend and the estimates were above that,” Denn recalls. “We received the rendering back from him with three distinct red lines on it to indicate how to convert the 55 metre into a 50 metre under 500 GT”. At that point, the autumn of 2011, with the global financial crisis grinding on, the project stopped. “The next summer, I heard from the client again. He had a new manager and was ready to go,” says Denn. Designing resumed at the 50 metre/500 gross tonne limits, with Arcon Yachts managing the project and Heesen developing a new round-bilge hull form, combining the lines of its 47 metre displacement hull with the GA and beach club of 50 metre semi-displacement Satori. Sketches went back and forth, but besides the dark blue hull and wide, gentle stairs, the one element that both the owner and Denn kept returning to was an “arrow” feature, a sharp downward and outward angle on the upper deck bulwark that creates a dramatic space for the bridge wing station. That taut curve became Ann G’s defining style line. 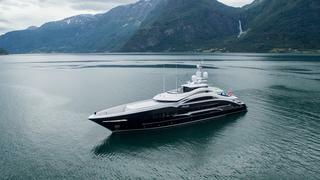 Heesen’s only difficulty seemed to be fitting a six metre tender on the bow. Try as they might with the original sheerline, it would be peeking over the rail and impacting the helmsman’s sightlines. Reymond picked up a vibe from the profile that reminded her of cars in the 1920s and 30s and began drawing an interior with lots of contrast; glass, steel, white onyx and ebony, but the client asked for the details to be “more square, more modern”. 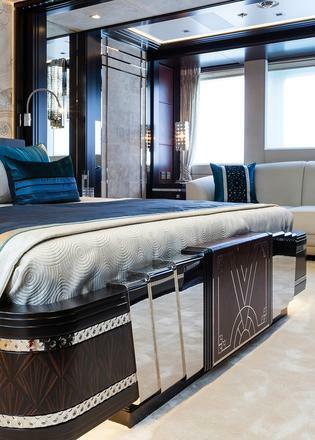 Reymond Langton responded with chunky, masculine details such as the stainless steel inlays in the foot of each bed frame. It is a style more Gotham than Paris and perhaps London’s Daily Express building or New York’s Chrysler building as its godparents. 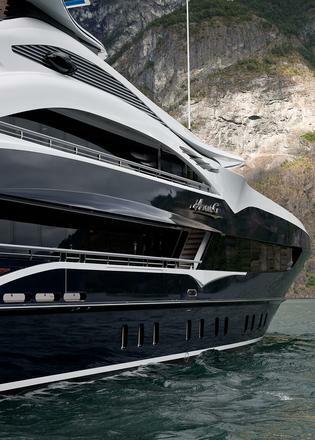 “The core of the yacht is the staircase. It needed to be a big story; it connects everything,” says Reymond. 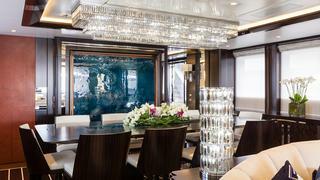 Its centrepiece is a custom light fixture by Crystal Caviar. 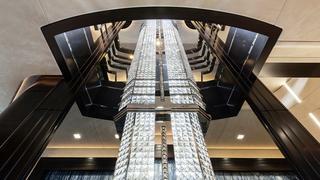 Extending two decks, backed by macassar ebony and framed by leather and ebony stairs, this is more giant sconce than chandelier and looks unmistakably like a glowing skyscraper. 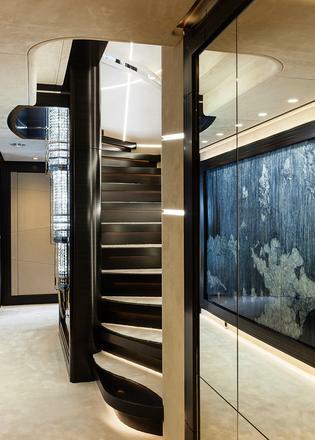 The stair surround features an intersecting lattice of cool-toned LED strip lighting set in leather panels that projects a graphic design on the black Portoro marble at each landing. “Strong diagonal lines aren’t deco but we used them to freshen the style,” says Reymond. It is a theme that reappears throughout. The main saloon of _Ann G _is designed for entertaining, with an intimate seating area adjoining a bar built of macassar and backlit onyx. 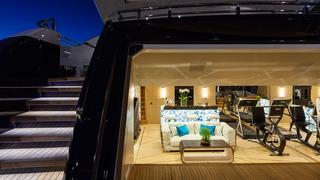 Extending aft through sliding glass panels, it visually and thematically links the interior to the aft deck. Forward, an elegant dining area is anchored by a three-tiered rectangular crystal chandelier, which contrasts with the planked floor below, while an ebonised tray ceiling detail and macassar window frames establish the homage to squares in the design. The owner’s suite is forward on the main deck and incorporates an office, full-beam cabin and large bathroom flanked by his and hers dressing rooms. 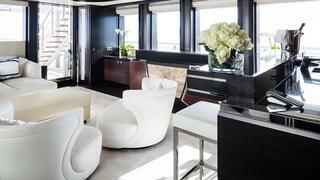 The primary design palette is white leather wall panels, cream carpet and macassar furniture banded in steel. Rich blue fabrics give relief to the contrast theme but the trump card is a silk velvet wall covering behind the headboard. “We designed the basic motifs for this wall covering and those in the guest suites and Sabina Fay Braxton executed them as one-of-a-kind murals,” says Reymond. Braxton once worked as a textile designer for the fashion house Lacroix. Her love of colour and texture in fabrics is down to her parents – a painter and a writer – who carted their daughter along as they lived and worked around the world. Braxton’s medium is a medieval Japanese wood block embossing process – called gauffrage in the West – that was used to mimic woven damask patterns in the 17th and 18th centuries. Coincidentally, the process was “rediscovered” during deco’s heyday and used to emboss 3D patterns on velvet upholstery. Braxton’s take on the process, “gilded gauffrage”, embosses the silk pile with heated carved blocks, encrusts the fabric with metal powders and paints broad areas with inks to create a patinated and luminous effect. 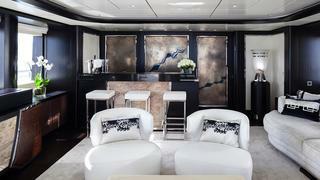 The upper deck saloon is subdued, with parchment wall panels. Here the dark/light contrast is downplayed to serve as a backdrop to the views through windows on three sides. The bar, instead of being a focal point, is tucked against the forward bulkhead. As the original driver of the GA, the beach club on the lower deck is the most contemporary space in style and function, with gym equipment, steam room, bar and a seating area offering uninterrupted views of the horizon when the transom door is open. Here, the joinery switches to elm and teak in sand-mimicking tones. 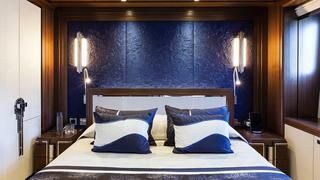 The proximity of the water is reflected in the striking backlit blue agate of the bar face. But Ann G is far more than a pretty face. On sea trials before delivery last July the yacht exceeded the contractual speed by 0.6 knots, reaching a top speed of 15.6 knots on a pair of 1,300hp MTU 8V4000 M63 engines. Of the fact that Ann G launched five years after the start of her design process, Kolpakov says: “We had a courageous owner who wasn’t afraid to try something new; we spoke night and day about the yacht. This is the kind of person [who] is moving the industry forward.” As well, of course, as creating a truly moving boat.